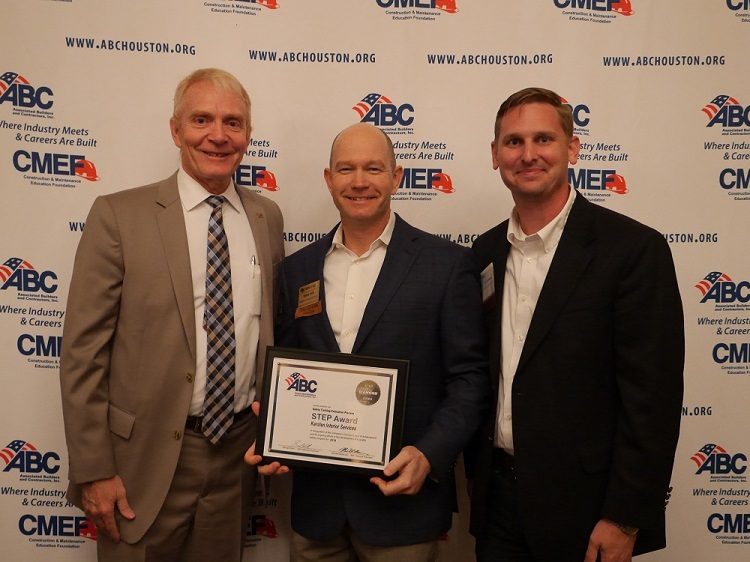 Karsten Interior Services was recognized as a Diamond Level Safety Training Evaluation Process (STEP) participant [the highest achievable level] at the Associated Builders and Contractors (ABC) July member breakfast that took place at the University of Houston Hilton. The STEP Program is an annual report that documents the dramatic impact of using proactive safety practices to reduce recordable incidents, making the best performing companies 670 percent safer than the industry average. Both large and small contractors alike can use the STEP program to improve the safety on jobsites and protect their workers. Karsten attributes this accomplishment to our Safety Director, Eddie Escamilla, who said, “I’ve been working towards this accomplishment for the past several years, and for it to finally come to fruition feels like a big milestone for the company. It is really an honor and without out our team putting safety as their number one priority, it would not have been possible”. With safety as a core value, Karsten will continue to strive for excellence and set the industry standard for safety.